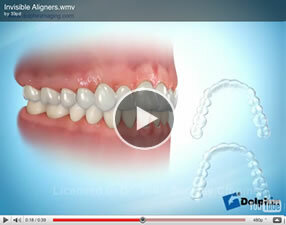 All of these systems consist of a series of clear plastic aligners worn over the teeth. They are almost invisible. It can be used for patients who are self conscious about the appearance of braces where very simple tooth movements are required. Invisalign and aligners are not suitable for everyone. Aligners are particularly ineffective at de-rotating teeth , and extruding teeth. Normally each aligner is worn for 2 weeks before moving onto the next aligner, provided your teeth have moved into the desired position. Aligners can be removed for cleaning and special social occasions . However this apparent advantage means that the appliances can be mislaid , and not worn adequately. Invisalign markets its product very extensively directly to the public. This fact alone rather than its effectiveness accounts for the fact that it is well known. Dr Buckley is a certified invisalign user, and will be happy to tell you whether or not invisalign is suitable for you.